Warning! Buyers beware of Smoky Joes custom smoker builds. See for yourself. SmokeRing Forum Post describing issues. I first started smoking meats over 30 years ago using a Little Chief electric smoker. These do a decent job on fish, jerky etc. The smoke flavor comes from finely chopped wood pieces placed in a pan over a heating element. They do not get very hot, therefore cold weather, rain etc. has a drastic effect on there peak temperature. Even on a hot day you are limited to smaller thinner cuts of meat. 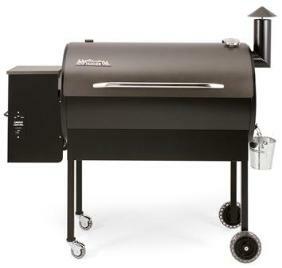 When it comes to Turkeys, Briskets or Pork Butts this is not a cooker to consider. As I stated prior, they work great for smoking fish etc. 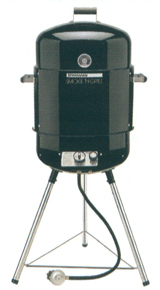 I quickly moved on to the Bullet type charcoal water smoker. My first was a Brinkman. I wore it out and bough a Weber. Both were equal in quality and both produced high quality smoked meats. I found it difficult to control the temperature over the duration of the cook. At some point you have to add charcoal briquettes and hard wood. They best way to do so is to utilize a charcoal chimney. This allows you to place the coals in the chimney, build a fire underneath with news paper and quickly get the charcoals burning white. Then the coals can be added to the coal pan. To restock wood you lift the entire barrel off the lower section and add the wood. This method allows you to retain heat. You should avoid white smoke as much as possible. Prolonged exposure to white smoke produces a bitter taste on the meat. You want to achieve a thin blue amount of smoke coming from the cooker. You also have to make sure the water pan has water or the temperature in the cooker will climb out of control scorching your meat. Another issue is flavor is affected buy transferring carcinogens from the coals to the meat. Although the metal used is thicker then that of a Little Chief type electric smoker the internal temperature will be affected buy rain, wind and cold temperatures. 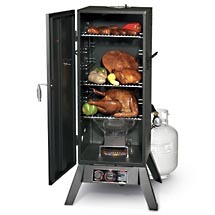 This cooker can handle the larger items such as Turkeys, Hams, Briskets and Pork Butts. It has a very flexible heat range as well. After dealing with Charcoal for a few years I decided to upgrade to a propane heated Bullet Style water smoker. It was at this point I started to appreciate less fooling with the cooker and a much more controlled temperature range. No more fooling with a charcoal chimney and adding briquettes. I still had to do my best to keep the smoke light and light blue to avoid bitter tasting meat. I still had to keep my water pan replenished to avoid the water boiling out and the temperature climbing. This was a great fit for me for some time and produced very high quality meats. When cooking ribs in the bullet type you are limited to grill space. When cooking ribs you are forced to roll them or cut the rack in sections. Rib racks allow you to cook more as the ribs are cooked on end (their sides). This unit is very flexible but it's limitations are grill size. Because of this I started to consider alternative options. My next upgrade was to a Great Outdoors Smoky Mountain Series propane heated vertical water smoker. The first thing I did was throw away the wood pan and purchase a 8" dutch oven to put the wood chips in and turned the wood pan grill grate upside down. This allowed me to get more light blue smoke and much tastier meat. This design proved to be much more desirable as I had a bit more cooking capacity. Another nice feature was the large front door which made checking meat temps, turning meats, mopping, adding water or wood very easy. This design does allow for more heat loss when doing these tasks but well worth it in the long run. There still is the issue where if you run out of water in the water pan the temperature will climb too high. With this design you still have to manage the wood in a way you get the optimum smoke and avoid prolonged exposure to white smoke. With this model you have a bit more grill real-estate but with ribs you still have to cut the rack in half and for larger feeds you have to use rib racks. 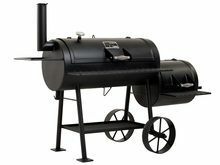 This unit I would consider to work very well for the guy who smokes meats on occasion or a couple times a month. 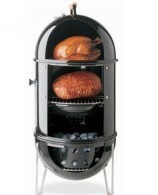 The Barrel Smoker is a flexible unit allowing you to use your choice of Charcoal with wood chucks or just hardwood. Most use jut hardwood hence the name stick burner. Depending on the size, one can cook a pretty hefty amount of meat. The average size is approximately 645 square inches of grill real-estate. If you use charcoal you are back to using a charcoal chimney as its most efficient when burning charcoal. Most use only hardwood. The fuel is loaded in the side fire box and ignited and burned. Smoke and heat rises filling the grill chamber. These are built of a heavier gauge metal. They are still influenced by outdoor weather but not to the extreme of the cookers above. This cooker style allows you to could full racks of ribs without cutting them up or rolling them up. I have not owned one of these but i have friend who have and I have cooked on them before. I liked the experience and the food was amazing when done. Now there are vertical versions of Barrel smokers as well. Most are made from drums. The Big Green Egg is a ceramic smoker/cooker that is know for its ability to keep temperatures fairly even and is very well insulated. These are charcoal heated and rely on wood chunks like the other propane and charcoal cookers. I have not cooked on one of these but they are very well know for the quality of meats they produce. 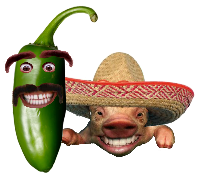 There are a few ceramic type like the Green Egg however most seem to go for the green Egg there fore since I have no personal data I will have to stick to what I believe to be a worthy cooker based on the postings from many individuals in the forums.. Recently although my Great Outdoors Smoky mountain series smoker has been producing very tasty eats, I was really getting tired of the ball and chain syndrome that accompanies all smokers that require Charcoal or wood to be added. After allot of research which included joining a couple smoking meat forums I decided on a Pellet Grill. 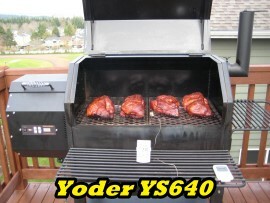 Not just any Pellet Grill but a Traeger based out of Oregon. They source their builds to China like most companies but the build quality is great. Cooking with a Traeger is a entirely new experience. Here's how they work. They have a hopper where you load allot of Pellets. The Pellets are recycled hardwood and are not regular wood stove grade. They are food grade so no glues are used to bind the wood. They come in Hickory, Apple, Maple, Oak, Pecan, Mesquite and Cherry. I may have missed a couple. There is a thermostat control. The OEM unit comes with a 3 position switch. Smoke (225), Medium (350) and High (425). This unit feeds pellets into a small fire box at a pre defined interval. There is an Optional digital thermostat that allows greater flexibility in temperature range and a more constant temperature control. I highly recommend this. This controller senses the temperature via a probe in the chamber and signals the auger to feed pellets as needed to maintain desired temperature. The Traeger has a blower motor that forces air across the fire box creating a convection heating affect. Allot of people will put on some big Pork butts and simply go to bed. there is no tending to the fire. They are extremely safe due to the design of the fire box and heat deflectors. They are safe then propane, charcoal and stick burners. I mentioned many times above to avoid prolonged exposure to white smoke as it bitters the meat. With the Traeger you don't have to worry about this at all. You also don't wind up smelling like a forest fire. The smoke delivery is thin blue smoke but constant providing a nice deep smoke ring without the bitter taste. The Traeger is far more flexible then the rest. Since its o forgiving, you can easily bake bread, biscuits (taste like scones) and even pizzas. If you have not had wood fire cooked pizza you are missing out. I can say with a smile this is one you can't pry out of my cold dead hands! I can put two 7 lbs pork butts on at 5 AM and for most of the day not touch a thing outside of misting the meat with apple juice from time to time. no more fooling with adding water, unstable temperatures or adding wood. In summary you will enjoy the cooking allot more. As for taste it produces the best tasting meats I have cooked in all my years smoking meats.